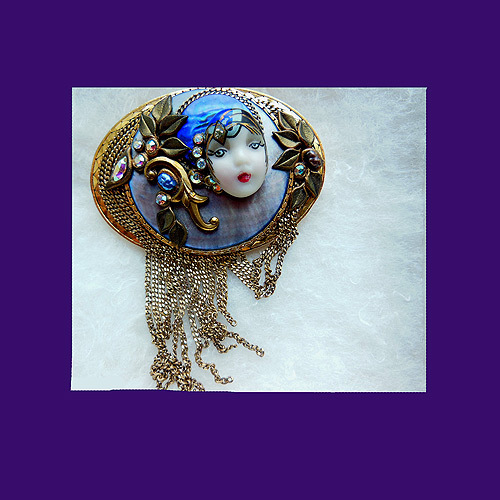 This vintage art deco face pin from MARENA is offered for your consideration. Fashioned in a side oval design, it has a dyed lavender mother-of-pearl background upon which carved golden leaves, tiny beads and aurora borealis stones adorn the lovely face that wears a deep blue iridescent headpiece. Hanging chains complete the presentation which is notable in every way. The back is finished in a gleaming gold tone, has a a roll-over pin closure and two loops that allow it to be worn as a pendant. The stamp, MARENA HAND MADE IN GERMANY appears under the clasp. Measuring 1 1/2" in length and 2" across, it comes in mint, never used condition. Make a Marena pin yours and you'll never regret it!